A Bar-tailed Godwit has been tracked from its Southern Hemisphere summertime home in New Zealand to its breeding ground in Alaska—and back again. A female known as E7, landed in New Zealand after taking just a week to fly 11,500 km from Alaska. Unlike seabirds, which feed and rest on long journeys, Godwits just keep going. E7 set her first record on the way north, when she flew non-stop for 10,200 km to Yalu Jiang in China. 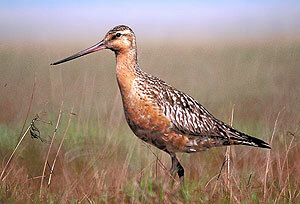 She then flew a further 5,000 km to the Godwit breeding grounds in Alaska. And on the way back to New Zealand, her electronic tag still working, E7 set another record of 11,500 km. As if that is not amazing enough, any chicks E7 produced during her two months in Alaska will make the same journey. At just two months of age. ‘Some might fly down in flocks with adults but other ones will fly down without any adults involved at all which is pretty amazing,’ said Dr Battley, Massey University ecologist. What an amazing thing! No map or compass—no jet engines, just an amazing design that man can but stand in awe of because she, E7, is so wonderfully made. Why is there such a bird? Why does it need to fly so far? Accident? Random chance? This bird just happened to find its way? No. Very intelligent and creative design and great aerodynamics by a very Intelligent Designer. She was purpose-built to fly because the designer wanted us to know how wonderful He is. Science is now revealing so many new and wonderful aspects of God’s creation. We might ask the same questions about man. Why did You do it? Why bother making man, especially when we were going to cause so much pain and suffering? Because He is a God who cares and wants to have a relationship with His creation. At this time of the year we are reminded just how much He does care, because we remember that He sent His Son to show us a way out of our own foolishness. Now we know that He holds little E7 aloft for 11,500 km—just imagine how he wants to care for us too. Yet we so easily forget, or some reading this might not even know, that He not only sent his Son, as a little baby, to love us but that He would love us so much He would die for us too. In one of the cruelest deaths man’s hardened heart could devise—the slow agonising death on a cross. Why do men and women today not see Him? Because their hearts have been ‘hardened’ against Him through the teaching of evolution which has stopped us seeing Him through His amazing creation. As Christmas comes may we soften our hearts so that we can see His love through His creation all around us and long to share Him with others. We trust you will all have a happy and blessed Christmas. Griggs, K., Godwit makes huge Pacific flight, BBC News, Wellington, New Zealand, 11 September 2007. Return to Text.